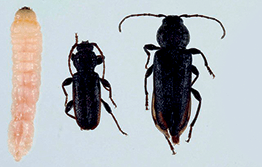 European house borer (EHB) is a destructive pest of seasoned coniferous timber, including pine, fir and spruce. It can cause major structural damage to buildings and pine furniture, as well as architraves and frames. It’s found in Western Australia. If you think you have seen European house borer, call 1800 084 881. European house borer can be spread through the movement of infested host timber and timber products including building materials, packaging, pallets, furniture, ornaments and firewood.